Below is my “Day Out” column from The Weekend supplement in the Saturday, July 27, 2013, issue of the South Wales Evening Post. WHEN? Margam Park is open daily between 10am and 6pm until September 1. ANYTHING ELSE IN THE AREA? At the South Wales Miners’ Museum in Afan Forest Park visitors have the chance to take a step back in time and see what life was like for miners and their families through their eyes. The museum celebrates the coal mining industry and its workforce in the South Wales coalfield. The past is brought to life at the museum using a comprehensive collection of photographs, historical artefacts and even life sized models of miners dressed in original gear and equipment. There is a small charges to help with the costs of running the museum. Entrance fees are £3 for adults and £2 for seneiors and children 5 and older. Situated close to the museum is a range of outdoor exhibits including a blacksmith shop and lamp room to check out. The museum is located in the beautiful Afan Valley and is only six miles on the A4107 from the M4. For sat-nav users the address and postcode is: South Wales Miners' Museum, Afan Forest Park, Cynonville, Port Talbot, SA13 3HG. Pre booking is advisable. Phone 01639 851833 or go to www.southwalesminersmuseum.co.uk. 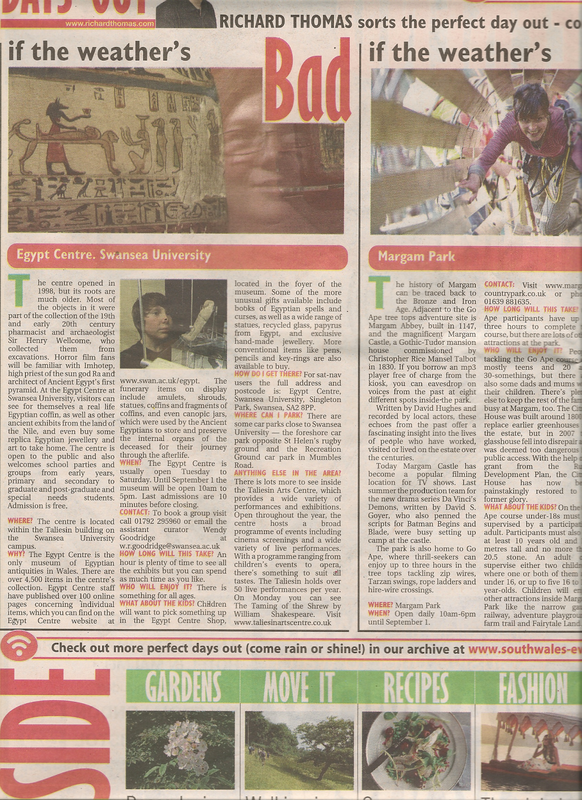 The Egypt Centre opened in 1998, but its roots are much older. Most of the objects in the Centre were part of the collection of the 19th and early 20th century pharmacist and archaeologist Sir Henry Wellcome, who collected them from excavations. Horror film fans will be familiar with Imhotep, High Priest of the sun God Ra and architect of Ancient Egypt’s first pyramid. At the Egypt Centre at Swansea University visitors can see for themselves a real life Egyptian coffin, as well as other ancient exhibits from the land of the Nile and even buy some replica Egyptian jewellery and art to take home. The Centre is open to the public and also welcomes school parties and groups from early years, primary and secondary to graduate and post-graduate and special needs students. Admission is free. WHEN? The Egypt Centre is usually open Tuesday to Saturday. Until September 1 the musum will be open 10am to 5pm. Last admissions are 10 minuets before closing. CONTACT: To book a group visit call 01792 295960 or email the assistant curator Wendy Goodridge at w.r.goodridge@swansea.ac.uk. HOW LONG WILL THIS TAKE? An hour is plenty of time to see all the exhibits but you can spend as much time as you like. WHAT ABOUT THE KIDS? Children will want to pick something up in the Egypt Centre Shop, located in the foyer of the museum. Some of the more unusual gifts available include books of Egyptian spells and curses, as well as a wide range of statues, recycled glass, papyrus from Egypt, and exclusive hand-made jewellery. More conventional items like pens, pencils and key-rings are also available to buy. HOW DO I GET THERE? For sat-nav users the full address and postcode is: Egypt Centre, Swansea University, Singleton Park, Swansea, SA2 8PP. ANYTHING ELSE IN THE AREA? There is lots more to see inside the Taliesin Arts Centre which provides a wide variety of performances and exhibitions. Open throughout the year the centre host a broad programme of events including cinema screenings and a wide variety of live performances. With a programme ranging from children's events to opera, there's something to suit all tastes. The Taliesin hold over 50 live performances per year. On Monday you can see The Taming of the Shrew by William Shakespeare. Visit www.taliesinartscentre.co.uk. Below is my “Days Out” column from The Weekend supplement in the Saturday, July 20, 2013, issue of the South Wales Evening Post. Hit the race tracks at Skidz Karting in Swansea! 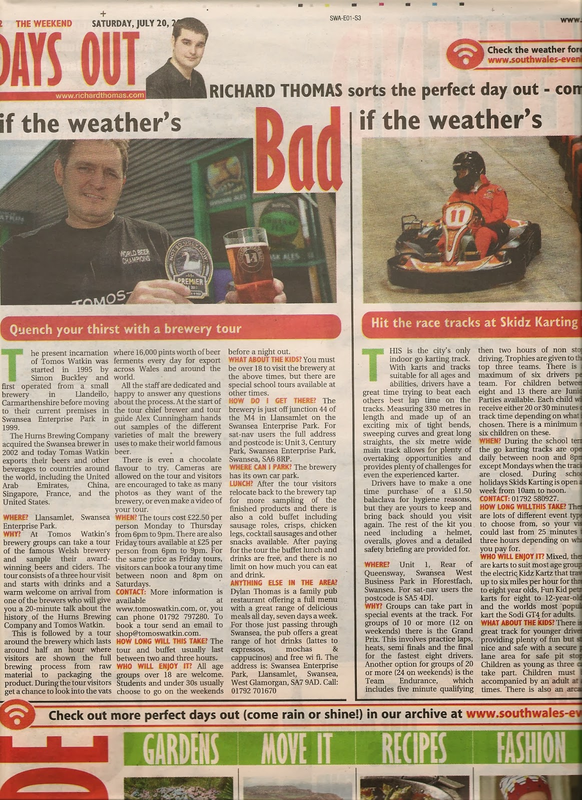 Skidz Karting is Swansea’s only indoor go karting track. With karts and tracks suitable for all ages and abilities, drivers young and old will have a great time trying to beat each others best lap time on the tracks. Measuring 330 meters in length and consisting of an exciting mix of tight bends, sweeping curves and great long straights, the 6 meter wide main track allows for plenty of overtaking opportunities and provides plenty of challenges for even the most experienced go karter. Drivers will have to make a one time purchase of a balaclava for hygiene reasons, but these only cost £2 each and are yours to keep and bring back next time. All the other kit, including a helmet, overalls, gloves and a detailed safety briefing are provided for. WHERE? The address is: Unit 1, Rear of Queensway, Swansea West Business Park in Fforestfach, Swansea. For sat-nav users the postcode is SA5 4DJ. WHY? Groups can take part in special events at the track. For groups of ten or more (12 on weekends) there is the Grand Prix. This involves practice laps, heats, semi finals and the final for the fastest eight drivers. Another option for groups of 20 or more (24 on weekends) is the Team Endurance, which includes five minute qualifying then two hours of non stop driving. Trophies are given to the top three teams. There is a maximum of six drivers per team. For children between eight and 13 there are Junior Parties available. Each child will receive either 20 minuets track time or 30 minuets track time depending on the time chosen. There is a minimum of six children on these. If you're looking for a birthday or special gift idea, then why not buy a Skidz Karting gift voucher. They'll make a great gift and can be used as part or full payment for any type of session offered at the track. WHEN? During the school term the go karting tracks are open daily between 12pm and 8pm, except Mondays when the tracks are closed. During school holidays Skids Karting is open seven days a week from 10am to 8pm. HOW LONG WILL THIS TAKE? There are lots of different event types to choose from, so your visit could last from 25 mins to three hours depending on what you pay for. 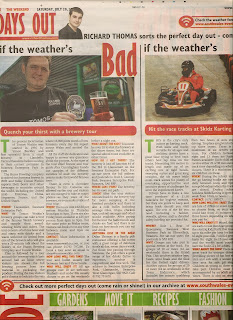 For more information about the events and prices visitwww.skidzkarting.co.uk. WHO WILL ENJOY IT? Mixed, there are karts to suit most age groups: the electric Kidz Kartz that travel up to 6 miles per hour for four to eight year olds, Sodi Fun Kid petrol karts for eight to 13 year olds, and the worlds most popular kart the Sodi GT4 for adults. WHAT ABOUT THE KIDS? There is a great track for younger drivers, providing plenty of fun but still nice and safe with a secure pit lane area for safe pit stops. Children as young as three can take part. Children must be accompanied by an adult at all times. There is also an arcade near the track. HOW DO I GET THERE? Skidz Karting are more than happy to help you with your travel arrangements to and from the track. Minibuses are available for 16-36 seats as well as taxis for smaller groups. LUNCH? Along with two great tracks there is also a games room with driving simulators where you can get some practice before you go on the track, a pool table, air hockey table, and a cafe serving light refreshments to check out. Skidz Karting have also negotiated a great deal for parties (min of ten people) at the Smoke Haus (www.thesmokehaus.co.uk) on Swansea's Wind Street in the heart of the night life. Stag/hen/birthday boy/girl eats completely free, and there is a free bucket of chicken wings for all to share as a starter, and 10% discount off the food bill. ANYTHING ELSE IN THE AREA? The Chocolate Factory is unique in Swansea: a real, working chocolate factory offering informative tours for individuals and groups of all ages. With the popularity of the Charlie And The Chocolate Factory film starring Johnny Depp, and the original novel by Roald Dahl, The Chocolate Factory is a fun place to take the kids during their summer break from school. And the tour guide, almost like a real-life Willy Wonka, makes sure everyone on the tour gets a chance to see the different factory equipment and taste all the chocolate. After getting kitted up in the factory’s fashionable hairnets and aprons, the tour begins with a detailed talk about the history of chocolate, from its popularity among the ancient Olmecs and Aztecs of Central America to its discovery by Christopher Columbus and the Spanish Conquistador who conquered Mexico, Hernando Cortes. This is followed by a walk on the factory floor where you are shown the factory machinery and given a demonstration by Gareth John of how they melt, temper and re-mould chocolate into football shaped lollies, chocolate hearts and other bespoke items. For sat nav users the address and postcode is: The Chocolate Factory, Swansea West Industrial Park, Fforestfach, Swansea, SA5 4DL. Visitwww.thechocfactory.com. The present incarnation of Tomos Watkin was started in 1995 by Simon Buckley and first operated from a small brewery in Llandeilo, Carmarthenshire before moving to their current premises in Swansea Enterprise Park in 1999. The Hurns Brewing Company acquired the Swansea brewer in 2002 and today Tomas Watkin exports their beers and other beverages to countries around the world, including the United Arab Emirates, China, Singapore, France, and the United States. WHERE? Llansamlet, Swansea Enterprise Park. WHY? At Tomos Watkin’s brewery groups can take a tour of the famous Welsh brewery and sample their award wining beers and ciders. The tour consists of a three hour visit and starts with drinks and a warm welcome on arrival from one of the brewers who will give you a 20 minuet talk about the history of the Hurns Brewing Company and Tomos Watkin. This is followed by a tour around the brewery which lasts around half an hour where visitors are shown the full brewing process from raw material to packaging the product. During the tour visitors get a chance to look into the vats where 16,000 pints worth of beer ferments every day for export across Wales and around the world. All the staff are dedicated and happy to answer any questions about the process. At the start of the tour chief brewer and tour guide Alex Cunningham hands out samples of the different varieties of malt the brewery uses to make their world famous beer. There is even a chocolate flavour to try. Cameras are allowed on the tour and visitors are encouraged to take as many photos as they want of the brewery, or even make a video of your tour. WHEN? The tours cost £22.50 per person Monday to Thursday from 6pm to 9pm, there are also Friday tours available at £25 per person from 6pm to 9pm. For the same price as Friday tours, visitors can book a tour any time between 12pm and 8pm on Saturdays. CONTACT: More information is available at www.tomoswatkin.com, or, you can phone 01792 797280. To book a tour send an email toshop@tomoswatkin.com. HOW LONG WILL THIS TAKE? The tour and buffet usually last between two and three hours. WHO WILL ENJOY IT? All age groups over 18 are welcome. Students and under 30s usually choose to go on the weekends before a night out. WHAT ABOUT THE KIDS? You must be over 18 to visit the brewery at the above times, but there are special school tours available at other times. HOW DO I GET THERE? The brewery is just off junction 44 of the M4 in Llansamlet on the Swansea Enterprise Park. For sat-nav users the full address and postcode is: Unit 3, Century Park, Swansea Enterprise Park, Swansea, SA6 8RP. WHERE CAN I PARK? The brewery has its own car park. LUNCH? After the tour visitors relocate back to the brewery tap for more sampling of the finished products and there is also a cold buffet including sausage roles, crisps, chicken legs, cocktail sausages and other snacks available. After paying for the tour the buffet lunch and drinks are free, and there is no limit on how much you can eat and drink. Below is my “Days Out” column from The Weekend supplement in the Saturday, July 13, 2013, issue of the South Wales Evening Post. 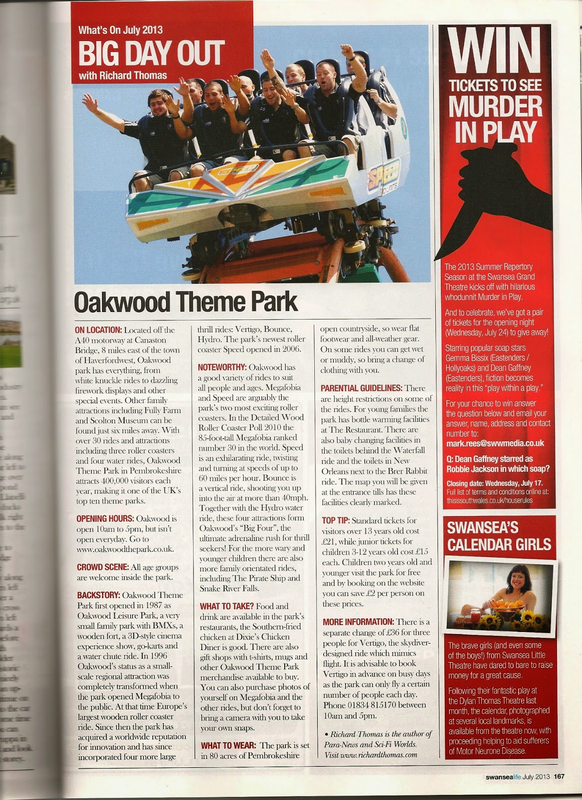 Oakwood Theme Park in Pembrokeshire, take the drop on Vertigo, then pan for gold and have lunch at Dixie's Chicken Diner. The perfect day out when the sun is out. Oakwood park provides fun for all the family, from white knuckle rides to dazzling firework displays and other special events Oakwood has it all. Oakwood Theme Park first opened in 1987 as Oakwood Leisure Park, a very small family park with BMXs, a wooden fort, a 3D-style cinema experience show, go-karts and a water chute ride. In 1996 Oakwood’s status as a small-scale regional attraction was completely transformed when the park opened Megafobia to the public. At that time Europe's largest wooden roller coaster ride. Since then the park has acquired a worldwide reputation for innovation and has since incorporated four more large thrill rides: Vertigo, Bounce, Hydro and the park’s newest roller coaster Speed opened in 2006. Standard tickets for visitors over 13 years old cost £21, while junior tickets for children 3-12 years old cost £15 each. Children two years old and younger visit the park for free and by booking on the website you can save £2 per person on these prices. WHERE? Located off the A40 motorway at Canaston Bridge, 8 miles east of the town of Haverfordwest. WHEN? Oakwood is open 10am to 5pm, but isn‘t open everyday. To find out what days the park is open go to www.oakwoodthepark.co.uk. CONTACT: Phone 01834 815170 between 10am and 5pm. HOW LONG WILL THIS TAKE? With so many attractions to see, this is a full day out. WHO WILL ENJOY IT? Oakwood has a good variety of rides to suit all people and ages. Megafobia and Speed are the park's two most exciting roller coasters. In the Detailed Wood Roller Coaster Poll 2010 the 85-foot-tall Megafobia ranked number 30 in the world. Speed is an exhilarating ride, twisting and turning at speeds of up to 60 miles per hour. Bounce is a vertical ride, shooting you up into the air at more than 40mph. Together with the Hydro water ride, these four attractions form Oakwood’s “Big Four”, the ultimate adrenaline rush for thrill seekers. For younger children there are also more family orientated rides, including The Pirate Ship and Snake River Falls. WHAT ABOUT THE KIDS? There are height restrictions on some of the rides. For young families the park have bottle warming facilities at The Restaurant. There are also baby changing facilities in the toilets behind the Waterfall ride and the toilets in New Orleans next to the Brer Rabbit ride. The map you will be given at the entrance tills has these facilities clearly marked. HOW DO I GET THERE? From South Wales follow the M4 West until Junction 49 and take the A48 to Carmarthen. Oakwood is clearly signposted on brown tourist information signs from the end of the M4 and throughout Pembrokeshire. For sat-nav users the postcode is SA67 8DE. WHERE CAN I PARK? Oakwood has free parking. LUNCH? Food and drink are available in the park’s restaurants, the Southern-fried chicken at Dixie's Chicken Diner is good. ANYTHING ELSE IN THE AREA? Fully Farm is just six miles away. The farm's Jolly Barn is home to a huge variety of farmyard animals, including sheep, pigs, donkeys, horses, chickens and other farm animals. There's also loads of opportunities for children to get hands-on during the Pet Handling sessions in the nearby Pets' Centre which is home to rabbits, guinea pigs, tortoises, parrots and lots more. But with over 50 different species and more than 250 animals, Folly Farm’s zoo is the big highlight. As well as giraffe Folly Zoo has zebra, Bactrian camels, pythons and other animals to see. And with zoo keeper talks, the chance to watch the animals during feeding times, and a whole host of fascinating facts on Folly Zoo’s animal enclosure signs, you’ll go home knowing a lot more about the different species. And if all that isn’t enough there’s even a go-kart racetrack! For more information go to www.folly-farm.co.uk. Tenpin Swansea, strike it lucky then enjoy a film and Joes Icecream afterwards. Tenpin Swansea, formerly Megabowl, is the only ten pin bowling alley in Swansea. There you'll find plenty of lanes where you can show off your strike to your friends, family or colleagues. They offer children, teen and adult parties, corporate celebrations, great nights out and cures for boredom, as well as tasty food and refreshing drinks from our Beach Road Café and fully licensed bar. And when you're done bowling, you can visit the arcades or go for a game of pool. One game costs £6.99 per adult and £5.49 each for juniors. You can also play two games for £12.25 (adults) and £9.75 (juniors), and three games for £13.75 (adults) and £11.25 (juniors). There’s also special family deals available. A family of four people can play a game for £21.99 or two games for £38.99. Bowling shoes are provided. WHERE? Tenpin is located in the Parc Tawe shopping and leisure complex near the city centre. WHY? The alley boasts 26 bowling lanes, three American pool tables, an amusements arcade and cosmic bowling nights. WHEN? The bowling alley is open 11am to 12am on weekdays and 10am to 12am on weekends. During the school holidays they are open 10am to 12am seven days a week. The bar closes at 11.30pm. CONTACT: Phone 0871 873 3150. HOW LONG WILL THIS TAKE? As long as your game lasts. WHO WILL ENJOY IT? People of all abilities, from first time players right up to veteran bowlers will enjoy a game. There’s also an amusements arcade where you can try to win a prise on the claw machines, or, you can just chill out watching Sky Sports in the fully licensed bar or playing pool on the three American pool tables. WHAT ABOUT THE KIDS? All ages are welcome in the bowling alley. HOW DO I GET THERE? For sat nav users the address and postcode is Parc Tawe, The Strand, Swansea, SA1 2AX. WHERE CAN I PARK? There is free parking in the in the Parc Tawe car park. LUNCH? Add £3 per person to the price of a family game to get a burger meal in the Beach Road Cafe Bar inspired by the sun bleached, chilled-out beach vibe of Bondi. ANYTHING ELSE IN THE AREA? 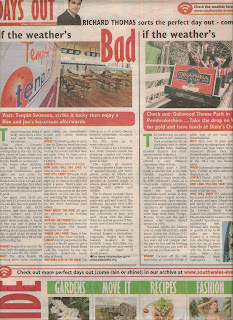 The Odeon is a 10 screen cinema situated in the Park Tawe shopping complex, right next door to Tenpin Bowling. For film times go to www.odeon.co.uk/fanatic/film_times/s19/Swansea. There is also a Joes Icecream and Dinky Donuts inside the shopping complex just outside Plantasia, which is another great place to visit. The superb all weather attraction houses a huge variety of unusual animals and exotic plants, some of which are extinct in the wild. The tropical paradise is housed inside a unique glass pyramid and is just bursting with plants and wildlife. The hothouse contains three climate zones: Tropical with a rainforest, Arid and Humid. The collection includes over 5,000 plants ranging from banana plants, giant bamboo, coconuts and collections of ferns and cacti. Along with the plants there are several species of fish, exotic insects and other animals to see. These include piranhas, a bearded dragon, a chameleon, tarantulas, snakes and even tamarin monkeys. In the butterfly house butterflies can be seen flying freely and viewed at various stages of development. For more information go to www.plantasia.org. Below is my “Days Out” column from The Weekend supplement in the Saturday, July 6, 2013, issue of the South Wales Evening Post. 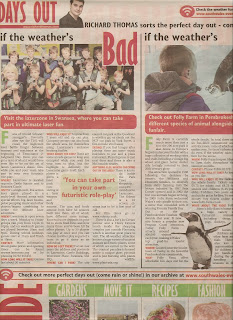 Folly Farm in Pembrokeshire, where you can see over 50 different species of animal, and vintage funfair. Folly Farm is much more than just a zoo, the 200 acre park is also home to Europe's largest undercover vintage funfair with a huge collection of working rides and stalls including a vintage big wheel and giant helter skelter ride lovingly restored to their 20th century glory. Folly Farm opened in 1988 following the decision by the owners, the Williams and Ebsworth families, to diversify from dairy farming into the leisure industry. 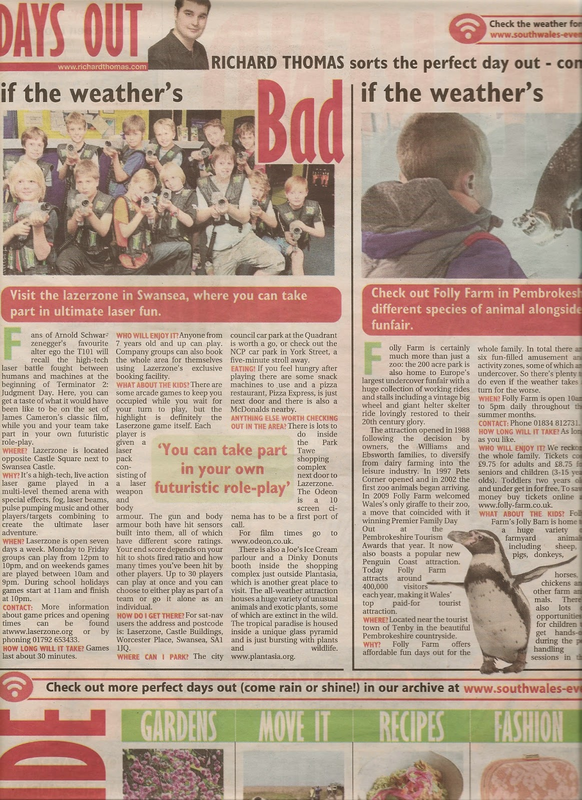 In 1997 Pets Corner opened and in 2002 the first zoo animals arrived. In 2009 Folly Farm welcomed Wales' only giraffe to their zoo, a move that coincided with Folly Farm winning Premier Family Day Out at the Pembrokeshire Tourism Awards that year. Today Folly Farm attracts 400,000 visitors each year, making it Wales' top paid-for tourist attraction. WHERE? Located near the tourist town of Tenby in the beautiful Pembrokeshire countryside. WHY? Folly Farm offers affordable fun days out for the whole family. In total there are six fun-filled amusement and activity zones, some of which are undercover. So there's plenty to do even if the weather continues to be bad. WHEN? Folly Farm will be open 10am to 5pm daily throughout the summer months. HOW LONG WILL THIS TAKE? As long as you like. WHO WILL ENJOY IT? Folly Fram is fun for all the family. Tickets cost £9.75 for adults and £8.75 for seniors and children (3-15 year olds). Toddlers two years old and under visit Folly Farm for free! To save money buy tickets online at www.folly-farm.co.uk. WHAT ABOUT THE KIDS? Folly Farm's Jolly Barn is home to a huge variety of farmyard animals, including sheep, pigs, donkeys, horses, chickens and other farm animals. There's also loads of opportunities for children to get hands-on during the Pet Handling sessions in the nearby Pets' Centre which is home to rabbits, guinea pigs, tortoises, parrots and lots more. But with over 50 different species and more than 250 animals, Folly Farm’s zoo is the big highlight. As well as giraffe Folly Zoo has zebra, Bactrian camels, pythons and other animals to see. And with zoo keeper talks, the chance to watch the animals during feeding times, and a whole host of fascinating facts on Folly Zoo’s animal enclosure signs, you’ll go home knowing a lot more about the different species. And if all that isn’t enough there’s even a go-kart racetrack! HOW DO I GET THERE? For sat-nav users the address is and postcode is: Folly Farm, Begelly, Kilgetty, Pembrokeshire, SA68 0XA. WHERE CAN I PARK? Folly Farm has a car park. LUNCH? Food and drink are available at Folly Farm’s Ploughman's Restaurant. ANYTHING ELSE IN THE AREA? With over 30 rides and attractions including three roller coasters and four water rides, Oakwood Theme Park in Pembrokeshire attracts 400,000 visitors each year, making it one of the UK's top ten theme parks. Oakwood has a good variety of rides to suit all people and ages. Megafobia and Speed are the park's two most exciting roller coasters. In the Detailed Wood Roller Coaster Poll 2010 the 85-foot-tall Megafobia ranked number 30 in the world. Speed is an exhilarating ride, twisting and turning at speeds of up to 60 miles per hour. Bounce is a vertical ride, shooting you up into the air at more than 40mph. Together with the Hydro water ride, these four attractions form Oakwood’s “Big Four”, the ultimate adrenaline rush for thrill seekers! For the more wary and younger children there are also more family orientated rides, including The Pirate Ship and Snake River Falls. Oakwood is open 10am to 5pm, but isn't open everyday. 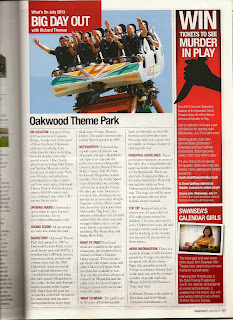 To find out what days the park is open go towww.oakwoodthepark.co.uk. lazerzone in Swansea, where you can take part in ultimate laser fun. Fans of Arnold Schwarzenegger's favourite alter ego the T101 will recall the high-tech laser battle fought between humans and machines at the beginning of Terminator 2: Judgment Day. At Laserzone in Swansea you can get a taste of what it would have been like to be on the the set of James Cameron’s classic film, while you and your team take part in your own futuristic warfare. WHEN? Laserzone is open seven days a week. Monday to Friday groups can play from 12pm to 10pm, and on weekends games are played between 10am and 9pm. During school holidays games start at 11am and finish at 10pm. CONTACT: More information about game prices and opening times can be found atwww.laserzone.org or by phoning 01792 653433. HOW LONG WILL THIS TAKE? Games last about 30 minuets. WHO WILL ENJOY IT? Anyone from 7 years old and up can play. Company groups can also book the whole area for themselves using Lazerzone’s exclusive booking facility. WHAT ABOUT THE KIDS? There are some arcade games to keep you occupied while you wait for your turn to play, but the highlight is definitely the Laserzone game itself. Each player is given a laser pack consisting of a laser weapon and body armour. The gun and body armour both have hit sensors built into them, all of which have different score ratings. Your end score depends on your hit to shots fired ratio and how many times you’ve been hit by other players. Up to 30 players can play at once and you can choose to either play as part of a team or go it alone as an individual. ANYTHING ELSE IN THE AREA? 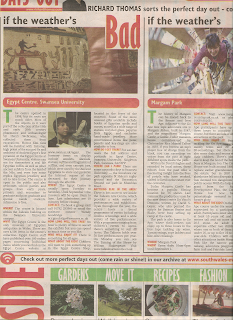 There is lots to do inside the Park Tawe shopping complex next door to Lazerzone.The Odeon is a 10 screen cinema situated in the Park Tawe shopping complex, right next door to Tenpin Bowling. For film times go to www.odeon.co.uk/fanatic/film_times/s19/Swansea. My column for the July 2013 issue of Swansea Life magazine. ON LOCATION: Located off the A40 motorway at Canaston Bridge, 8 miles east of the town of Haverfordwest, Oakwood park provides fun for all the family, from white knuckle rides to dazzling firework displays and other special events Oakwood has it all. Also other family attractions including Fully Farm and Scolton Museum can be found near Oakwood Theme Park, just six miles away. With over 30 rides and attractions including three roller coasters and four water rides, Oakwood Theme Park in Pembrokeshire attracts 400,000 visitors each year, making it one of the UK's top ten theme parks. OPENING HOURS: Oakwood is open 10am to 5pm, but isn‘t open everyday. To find out what days the park is open go to www.oakwoodthepark.co.uk. CROWD SCENE: All age groups are welcome inside the park. BACKSTORY: Oakwood Theme Park first opened in 1987 as Oakwood Leisure Park, a very small family park with BMXs, a wooden fort, a 3D-style cinema experience show, go-karts and a water chute ride. In 1996 Oakwood’s status as a small-scale regional attraction was completely transformed when the park opened Megafobia to the public. At that time Europe's largest wooden roller coaster ride. Since then the park has acquired a worldwide reputation for innovation and has since incorporated four more large thrill rides: Vertigo, Bounce, Hydro and the park’s newest roller coaster Speed opened in 2006. NOTEWORTHY: Oakwood has a good variety of rides to suit all people and ages. Megafobia and Speed are the park's two most exciting roller coasters. In the Detailed Wood Roller Coaster Poll 2010 the 85-foot-tall Megafobia ranked number 30 in the world. Speed is an exhilarating ride, twisting and turning at speeds of up to 60 miles per hour. Bounce is a vertical ride, shooting you up into the air at more than 40mph. Together with the Hydro water ride, these four attractions form Oakwood’s “Big Four”, the ultimate adrenaline rush for thrill seekers! For the more wary and younger children there are also more family orientated rides, including The Pirate Ship and Snake River Falls. WHAT TO TAKE? Food and drink are available in the park’s restaurants, the Southern-fried chicken at Dixie's Chicken Diner is good. There are also gift shops with t-shirts, mugs and other Oakwood Theme Park merchandise available to buy. You can also purchase photos of yourself on Megafobia and the other rides, but don’t forget to bring a camera with you to take your own snaps. WHAT TO WEAR: The park is set in 80 acres of Pembrokeshire open countryside, so wear flat footwear and all-weather gear. On some rides you can get wet or muddy, so bring a change of clothing with you. PARENTIAL GUIDELINES: There are height restrictions on some of the rides. For young families the park have bottle warming facilities at The Restaurant. There are also baby changing facilities in the toilets behind the Waterfall ride and the toilets in New Orleans next to the Brer Rabbit ride. The map you will be given at the entrance tills has these facilities clearly marked. TOP TIP: Standard tickets for visitors over 13 years old cost £21, while junior tickets for children 3-12 years old cost £15 each. Children two years old and younger visit the park for free and by booking on the website you can save £2 per person on these prices. MORE INFORMATION: There is a separate change of £36 for three people for Vertigo, the skydiver-designed ride which mimics flight. It is advisable to book Vertigo in advance on busy days as the park can only fly a certain number of people each day. Phone 01834 815170 between 10am and 5pm.